The relationship between Nyangatjatjara College and Champagnat Catholic College in Maroubra is long-standing and mutually beneficial. Champagnat Prinicpal David McInnes and his team put a huge amount of work into making our lads welcome when they visit their busy school in southern Sydney. We certainly try to reciprocate when their students visit us. 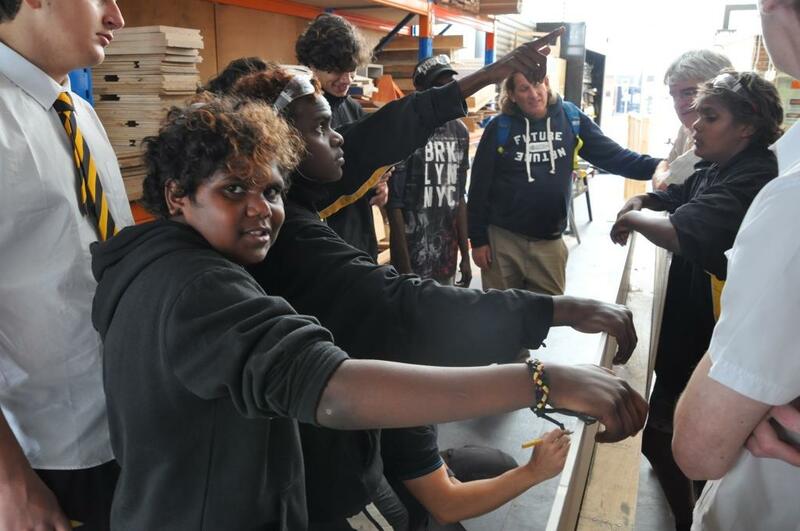 A group of Nyangatjatjara fellas travelled to Sydney in mid-June 2016 for a very successful visit. A focus this time was on VETiS and work education. We did some excellent workshops on carpentry and bricklaying. There was also Maths and other mainstream classes, plus of course plenty of sport. A group of Champagnat students and our own fellas went on a cultural walk around LaPerouse guided by local man Tim Ella. Our group included the most senior fellas at our school plus some of our younger lads, and this dynamic worked well. It is part of the role modelling that we are encouraging, with older students showing the way for our juniors. We were very comfortable in our hostel accommodation provided by the National Centre of Indigenous Excellence in Redfern.